NEW YORK/TORONTO (Feb. 1, 2017) – In support of their longstanding commitment to diversity and inclusion in hockey, the National Hockey League, the League’s Member Clubs and the National Hockey League Players’ Association (NHLPA) will spotlight a variety of community-related initiatives for Hockey Is For Everyone™ month. 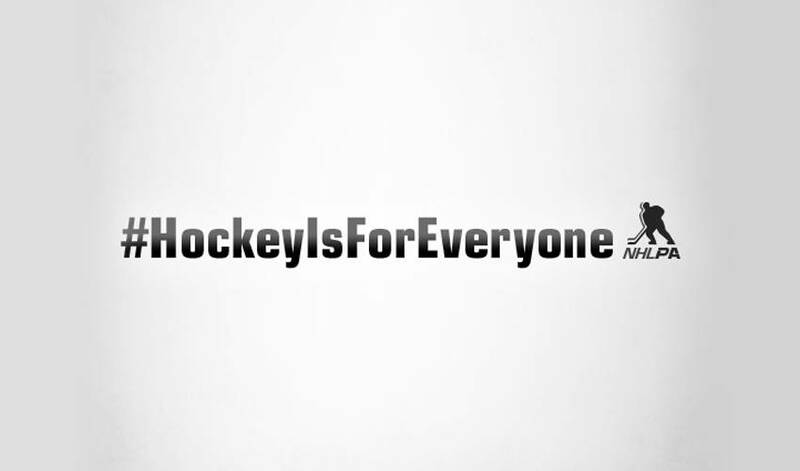 Every day throughout February, Hockey Is For Everyone activities will focus awareness on such areas as LGBTQ; ethnicity and gender equality; socio-economic status and those with disabilities. The campaign is conducted in partnership with the You Can Play Project – a nonprofit committed to supporting the LGBTQ community and fighting homophobia in sports. The campaign marks the first time the Players’ Association, the League and its Clubs have collaborated to encourage teamwork, inclusiveness and diversity in hockey at all levels daily for an entire calendar month. "Our Clubs, our players and our fans are committed to welcoming everyone to hockey," NHL Commissioner Gary Bettman said. "While the NHL family strives for diversity and inclusiveness all year long, February is Hockey Is For Everyone month, which will highlight, on a daily basis, the many ways our sport brings greater attention, heightened awareness and broader opportunities." Teams will host Hockey Is For Everyone™ awareness nights honoring and recognizing hockey players of all ages from diverse backgrounds including: sled hockey players, blind players, youth boys and girls players, special needs players, and recent immigrants. Sportsnet’s Hockey Night in Canada game on Feb. 11 (TOR vs BUF, 7 p.m.) and NBCSN’s Wednesday Night Rivalry game on Feb. 22 (WSH vs PHI, 8 p.m.) will be dedicated as Hockey Is For Everyone national broadcast nights. Fans are encouraged to join the conversation and share their stories of how hockey has made a positive impact by using the official hashtag #HockeyIsForEveryone. This season, NHL Clubs have designated one player to be a You Can Play ambassador, being a leader in the locker room and in the community on diversity, equality, and inclusion. Additionally, select Clubs will designate one home game as a You Can Play night, celebrating members of the local LGBTQ community with ceremonial puck drops, anthem singers, features on hometown heroes, and ‘Pride Tape’ will be used during pregame warm up. For the first time, fans can purchase ‘Pride Tape’ and NHL® team pride shirts on shop.NHL.com. A limited number of ‘Pride Tape’ wrapped sticks will be autographed by current NHL players and made available for auction at auction.NHL.com. Throughout the month, select Clubs will also host screenings of Soul On Ice: Past, Present, and Future. The film, which debuted last year, tells the stories of the contributions of black hockey players throughout history. NHL Alumni who helped pave the way, today’s stars and future prospects are featured in the film including: Hockey Is For Everyone™ ambassador Willie O’Ree, 2017 NHL All-Star MVP Wayne Simmonds, and 100 Greatest NHL Player Grant Fuhr. For a daily calendar of initiatives throughout the month of February visit NHL.com/HockeyIsForEveryone.